Before I talk about my first impressions of Black Ops II I want to touch upon the whole pre-order process, in particular the way Treyarch promoted the free Nuketown 2025 deal & Tesco’s handling of the midnight launch. Pre-Order Black Ops 2 and get Nuketown 2025 for free! I am yet to speak to anyone who picked up Black ops 2 on launch day and did not get the Nuketown 2025 download code with their copy of the game. It seems unlikely that Treyarch set out to deceive customers so I can only assume there were logistical issues, such as problems distributing two different items (pre&non-pre-order copies) on a large scale. It seems reasonable that they decided to include download codes with all launch stock to avoid a situation in which pre-order customers were left short. Whatever the reasoning, it’s a little annoying that there was literally no benefit to pre-ordering Black Ops 2. In fact, quite the opposite. OK, so I did get a little goodie bag containing some stickers, a pen, a couple of wristbands and a lanyard but none of it was of any interest so the whole lot is being palmed off on my 10 year old nephew. I should be elevated to “epic Uncle” status about 3 hours from now. I got to my local Tesco at 11.45 pm and, on arrival, there were approximately 300 people already in line. As I was approaching the queue I heard a distant cry of “pre-orders this way” and found myself around 50 people from the check-out. As the clock turned midnight the tills started ringing and, in true Tesco style, store staff worked through the queue as quickly as possible. I figured I’d be online by 12.15! Sadly not. Some 10 minutes later I still hadn’t moved. Why? Because the pre-order till had failed and no-one in the store seemed capable of rectifying the problem. Whilst the people who hadn’t pre-ordered the game were being served by 4 Tesco staff, we had just one. I felt sorry for the girl as people near the front were becoming increasingly vocal. As far as I could make out she was being offered no assistance by more senior staff, many of whom were looking over and just shrugging their shoulders. To me the solution seemed fairly obvious: re-direct the pre-order queue to the furthermost terminal on the main check-out area. This suggestion was deemed “impossible” by a member of staff. The wait continued. At 12:40 the till was fixed and the queue started moving. However, there was now additional drama. Many customers wanted to go for the £50 deal which included the game and a £25 PSN/XBOX live voucher however store staff suggested a “nationwide problem” meant the offer had to be withdrawn. I tweeted Tesco about this and they denied it was the case. Just before 1am a member of staff came over and announced that everyone who turned up without pre-ordering had been served and had now left. The other tills were now available…… OH, my suggestion wasn’t that outrageous then! I took the game and left, severely disappointed by the way in which Tesco staff handled the event. In their defence, their social media team has offered to post a £9 voucher to cover the additional cost of paying for the £25 PSN/XBOX card. Sadly this doesn’t make up for the wasted trip (to pre-order) and the hour of my life I could have otherwise wasted on Black Ops 2! 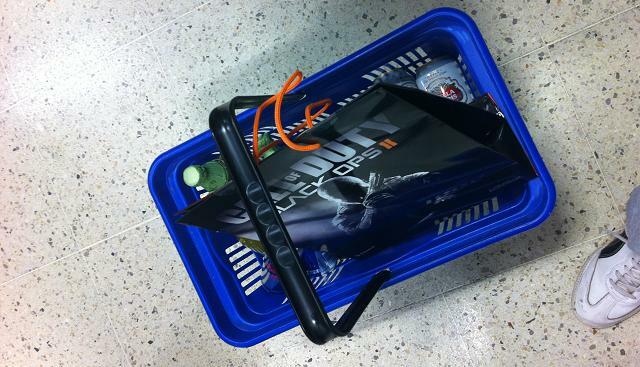 UPDATE: Tesco have just announced an extension to the “Get Black Ops 2 for £25” offer. You now have until Sunday to take advantage of the deal. I’ll assume the offer is now being recognised by all stores. In short, I’m enjoying the game. Yes it’s a little buggy in places but I’ve come to expect that of a Call of Duty release. I think it will be a while before a dominant class emerges as there are literally thousands of possible set-ups thanks to an all new points system. In essence, you have 10 points to use on making your class and you can allocate this to guns, attachments, perks and wildcards. Right now I’m having a lot of success with the PDW SMG. I have three attachments thanks to the “primary gunfighter” wildcard, three perks and a solitary lethal & tactical grenade. If I’m not using that then I’ll be running the DSR-50 sniper rifle with ‘only’ two attachments, meaning I can use a secondary weapon for those “oh sh*t” hitmarker moments. That said, there haven’t been many! The DSR-50 appears to be one hit kill no matter where you hit your target. I’m about to upload a post giving more detail on the best weapons and classes in Black Ops 2. I’ll link this bit of text when it goes live!